Image credit & copyright: Stephen Mudge. How many of you got to experience last week’s total lunar eclipse and Mars at opposition? Unfortunately, I wasn’t in its path but many where and the images have been spectacular. Here is a favorite that I’ve seen so far taken by Stephen Mudge of Brisbane, Australia. In this image the Red Moon and the Red Planet dive below the horizon in a stunning display as totality as totality takes hold just before disappearing. Something I always love to do with images like these is to gain some perspective which helps to make the image even more dramatic and I think it also helps to bring the details home where you can let them sink in. In this image, the moon was roughly 406,222 km (252,414 mi.) from Earth while the Red Planet, Mars is at a much further 70.8 million km (44 million mi.). Both of which, are being illuminated by a massive fusion reactor about 151 million km (94 million mi.) away in the opposite direction. 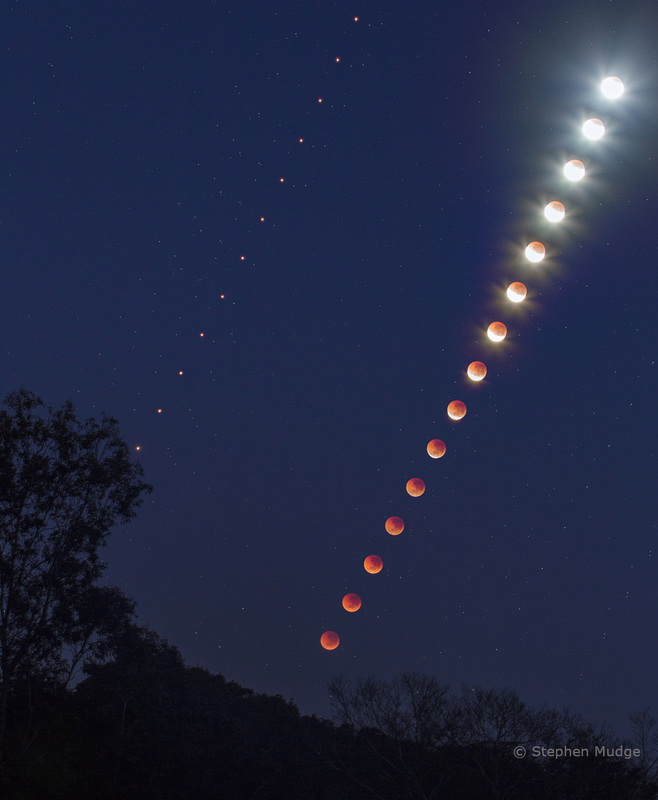 Image | This entry was posted in Astronomical Events, Astronomy (Learning), Eclipses (Solar & Lunar), Images, News, Solar System and tagged Astronomy, Astrophotography, DanSpace77, Eclipse, Lunar Eclipse, Mars, Moon, Science, Space, Stephen Mudge. Bookmark the permalink.